A group of about 100 people, mostly in black bloc, gathered at 4th and Capitol in downtown Olympia at 6pm on the first of May in response to a call to march “against the Port and its world” in celebration of May Day. There was an incredible abundance of supplies—shields, reinforced banners, flags of various sizes, and regular banners. The slogans included “Delete the Port – Delete the State,” “Against the Port and its World,” “Become Ungovernable,” and “We Are The Birds of the Coming Storm.” Some people came carrying a banner reading “sn(A)cks” and handed out hotdogs to the crowd. A sound system arrived, bringing a festive mood. 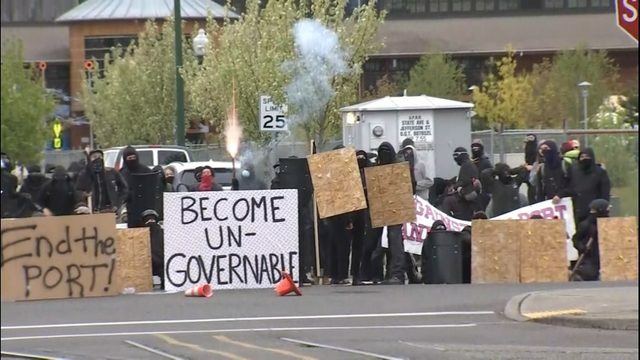 Though it is typical for hecklers to troll May Day and other anarchist street demonstrations, this year showed a clear escalation in antagonism from right-wing and fascist forces. Out on the street yesterday, it felt like civil war. Fighting against two different opponents—the police and right-wing vigilantes—was very difficult. Could deescalation have been used to keep the patriot types at bay while we we defended ourselves from the police? How do we differentiate organized alt-right/fascist militants from random aggressive jerks? How do we better ensure that we don’t hurt or enrage bystanders? An Analysis of #MayDay 2017 in #Olympia #WA | Enough is Enough!